You are reading page 3 of confused over titles !!. If you want to start from the beginning Go to First Page. were very technically skilled,(heart & lung sounds etc) but not as caring as Uk nurses. His opinion not mine!!! Any comments, this is interesting as Uk diploma nurses are accused of being too over-educated and technical compared to their "traditonally trained" colleagues, but US nurse education is way more adademic than UK, so does the care factor get lost? STOP! You kids are cracking me up! Happy holidays to all of you! Oh....... Peace is restored on my issue but.... LMFAO, susie I just ain't gettin into this one !!! OMG, what have ya started?? LOLOLOLOLOLOL, From the innocent query I asked, the answers are long and varied, as you can see but if i was you I'd close down me putor now... Can of worms ??? More like a neuclear explosion I'm thinking..
p.rabbit works as a RN. I think I can cut to the chase. Think of the Great Apes who thump their great barrel chests to scare off the other apes and establish their dominance in the clan/tribe. Of course we're all basic Nurses inside, so we have to have some kind of Acronym or Initializing method to establish our dominance in our great Nursing Tribe. Look, anybody can get an education. Does it make one a better person? Of course not. Nursing in general, (in the 20th and now 21st century)is like a wayward child, crying out to be heard, all the while forgetting that we already have a history that is thousands of years old. All those initials only serve to confuse the public along with other nurses in our own profession and call attention to our own tottering professional self esteem. Initials do not denote greatness, but rather they are a stab at questionable self assuredness. But, ya gotta admit, all those initials sure give rise to great possibilities don't they? I am mainly interested in ER and also OR and i would also like to have continuing education so that i can get a master degree. I never worked in Uk before. Do you some advices for me. I have often been said life was expensive there. What do you think ? I guess your experience will be positive for me. Jenny P works as a RN. Now if that article doesn't cause more confusion I don't know what will. Just looked at the Nursing 2000 article and boy-o-boy do we nurses ever have TON of initials we can use. If we all used these on our nametags we'd run out of room for our name! Yikes! 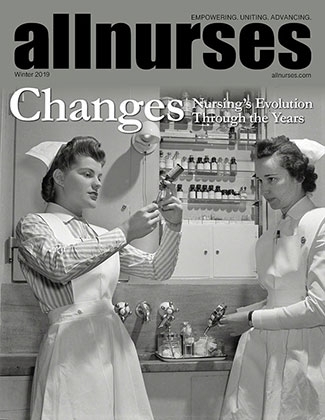 I don't know if the article is online but Nursing2000's site is www.springnet.com.